Rockland 5-pc. Microfiber Power-Reclining Sectional Sofa Leather-look seating with easy-care fabric—the Rockland 5-piece microfiber power-reclining sectional sofa has the patina of distressed leather but is actually upholstered in soft polished microfiber. Push-button power reclining offers infinite positions and the chaise style provides a continuous seating surface for outstanding support. With 2 reclining pieces, 2 armless chairs and a wedge, there's plenty of comfortable seating. The Rockland 5-piece sectional sofa is everything you need for relaxed living. Leather-look seating with easy-care fabric—the Rockland 5-piece microfiber power-reclining sectional sofa has the patina of distressed leather but is actually upholstered in soft polished microfiber. Push-button power reclining offers infinite positions and the chaise style provides a continuous seating surface for outstanding support. With 2 reclining pieces, 2 armless chairs and a wedge, there's plenty of comfortable seating. The Rockland 5-piece sectional sofa is everything you need for relaxed living. Everything is fantastic about this couch. The cushions are all attached, so there is no catching junk underneath anything. The material is excellent for everything, including not attracting pet hair, and easy clean up. With several kids sitting on this couch, my only complaint would be that the recliners are not offered in "manual", only the electric. I would have preferred the manual, simply because of having younger kids playing with the electronic controls all the time, I feel it may be easier to break the electronics. Other than that, we absolutely love this couch. We are a family of 6 with pets and friends, this couch seats a lot of people very comfortably. I just received my new microfiber power-sectional sofa and i love it so far bur its only 1 week old. i hope nothing goes wrong with the power reclining button but i have to say the sofa looks beautiful in my living room. i love, love. love it. I will report back to you in one year and let you know how everything looks and works. We love this sectional it is very comfortable and stylish. Everyone who has seen it loved it, they can't believe it is microfiber, it looks like a soft leather. The end recliners are awesome so comfortable. I would definitely recommend this set goes anywhere in your home. I love this couch. It fits perfect in my sunroom and is super comfortable. The color is also awesome. I look forward to laying on it after a long day at work. 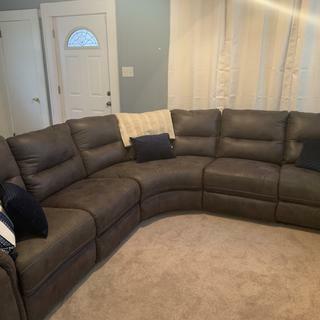 I would highly recommend this couch to anyone looking for a sectional couch. Its worth the price. power recliner. I have a cat that sheds and I find that the microfiber material is very easy to clean and remove any cat hair. This was a gift to myself and every time I walk into the room, I smile and don't regret one dollar that I spent to buy this furniture. This sectional is so comfy! The fabric really does look like leather! We could add or remove pieces to accommodate our space and the power recliners are a treat as well. No more arguing on who gets the best chair to out your feet up! It's a firm support yet very comfortable over all! Love! We have only had our sectional for a few days-however, we are very pleased. We had excellent customer service at the Bay Plaza store, no issues with delivery, and the sofa looks and feels perfect. I love the recliners and usb chargers are awesome! Highly recommended! This is the best sectional ever. Just straight enough to support my back, but plush and comfortable. Two reclining sections at each end are addictive! The material seems like a cross between suede and leather. It looks great and feels luxurious! Couldn't be happier! We literally went back three times to the store to make sure we really wanted this sectional. I cant tell you how happy we are that we went ahead and purchased it. It looks beautiful in our home and actually love it more then when it was in the showroom. The staff were fabulous. We would definitely shop here again. I absolutely love this sofa,so classy looking and wicked comfy! I would definitely recommend this to anyone.My only negative is that the power recliners are a little slow.But I love the fabric and the color!! Like the color very comfortable except one of the recliners didn’t lock in service is coming to look at it. Otherwise very happy with purchase.everyone that has seen it loves it. Have had this sofa a couple years now. Holds up well. Perfect fit for our room. I just purchased this collection and i'd like to protect the fabric from stains,etc. What should i do to protect the fabric from family life? BEST ANSWER: I didn’t do anything to protect it. As soon as I notice a spill I simply dampen a cloth and gently move it back and forth until I don’t see any remains of the spill. Is there an oversized ottoman available? Can you add a chaise to then left end of this couch ? BEST ANSWER: The Rockland collection does not include a chaise. How can I find a cover for this couch? BEST ANSWER: As the Rockland Sectional Sofa is a non-standard sofa size, it may require assistance from a professional reupholsterer, or an online search of "slipcover for sectional recliner" may bring possible results. Can I add two corner pieces together to make a "U-shape" sectional? If so what is the dimension of the 2 corner pieces placed together? BEST ANSWER: Two corner wedges can be used together, but would require end pieces with arms on each side. Each of the wedge pieces measure 53.5 X 53.5 X 39" H.
Can this sectional be purchased minus an armless piece ? BEST ANSWER: Yes. For assistance in selecting or removing individual pieces of a sectional, please contact 866-383-4484, option 3. When is friends and family discount? BEST ANSWER: Our Friends and Family Promotion typically runs twice a year. For specific details on our sales and promotions, please call 866-383-4484, option 3. What is the measurement of the wedge taken at the top of the piece around the curve? I need to compare this with my current sofa to make sure it fits in the same area. Thanks in advance. BEST ANSWER: The wedge will need 53.5" X 53.5" of space and measures approximately 81" around. Do they make this sofa in another color?